My name is Julie and I worked in a homeless shelter back in 1998-9 9. That’s where I was assigned when I signed up to give a year of service with Jesuit Volunteer Corps. 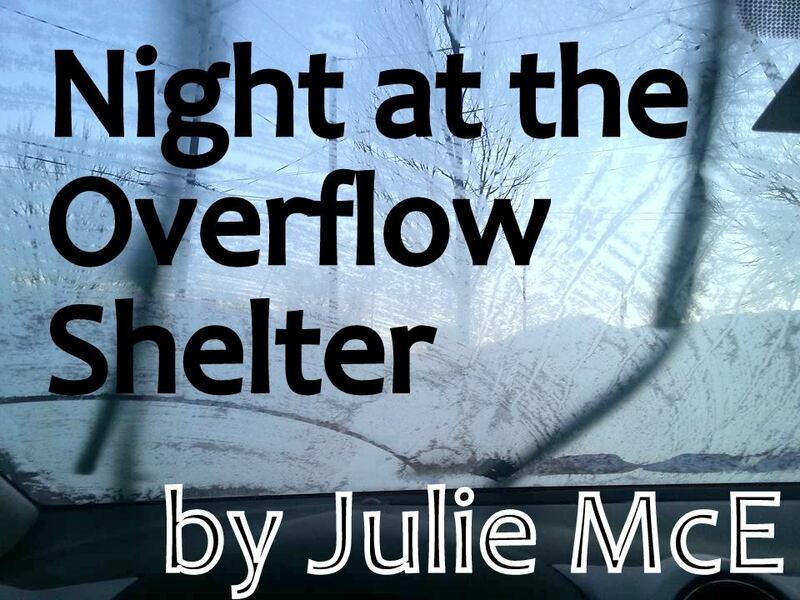 Since then, I’ve spent about 10 nights at homeless shelters, on overnight volunteer shifts. Most recently, I stayed overnight at one of Winston Salem’s Overflow Shelters which is set up at a church as emergency housing to keep guys from freezing to death during these cold months. There’s not enough room for them in the purpose-built shelters, so this solution has emerged. I’ve only been there twice, but I’m proud to say that I gave some guys something to laugh about both times. In January, I was a new face at supper, plopping myself down with them at a table. Since I’m trying not to weigh 230+ pounds anymore, I ate an apple while they supped. It was about my 10th apple for the week, so I decided to spice things up by shaking some pepper on it. Now, these guys had just spent ten minutes telling me they’ve seen crazy stuff on the street, wilder stuff that could be imagined, details that I could not handle hearing, but that I should trust them, they’ve seen some crazy stuff. I have no doubt about that. At the same time, when they saw me put pepper on my apple, they completely freaked out, saying they’d never seen anything so crazy. They asked how I could eat that. I’m proud of that moment, I really am. I shocked them, which isn’t easy. Then, the other night, we sat around the table discussing the types of food they’d love to see served one night. This is when I thought I’d be clever and use a fanciful word which I thought meant one thing. They looked at me, mouths agape, and said they could not believe their ears. Apparently, the word I said has a completely different connotation. No need to go into specifics here, but I’m proud to say that, even though I looked like the fool, I did give them a hearty laugh after a cold day spent outside. They laughed and laughed and laughed at me for that one. For three hours in the middle of the night, it was my job to stay awake. There is a man who is paid to stay awake overnight, but he didn’t seem too interested in chatting the night away, so I left him alone and arranged myself in a folding chair with a pillow, blanket and smart phone for entertainment. When I took breaks from yahoo news, I looked out at this sea of 20 mattresses on the floor, thinking about the men on them. If all was right with the world, these men would be in their own homes, with loving wives and dutiful children. They’d have enough money to provide for several other people and wouldn’t have to worry about just trying to survive. I love and care for my husband and want to do whatever I can to make his life easier for him. I was sad that, at least at this point in their lives, these men did not have someone to share such warmth with. The lights were turned on around 5:30 and the guys were out the door by 6:30. There are no showers there and this is where these guys sleep every night for months, so, do the math. 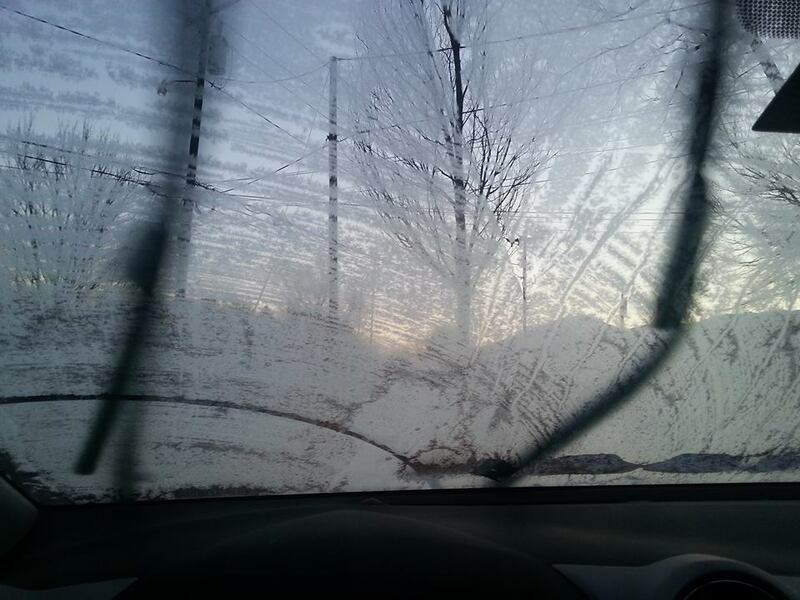 After they left, I sat in my car waiting for the defroster and wipers to clear the windshield, thinking about our divergent paths. From the Overflow Shelter, these guys were heading out for a long day outdoors in the cold. One mentioned that he’s ride buses all day, while another said he’d hang out at the bus station. They really didn’t have many options. Since the downtown library closed for renovations, they lost access to the couches, books, magazines, newspapers and restrooms that helped them get through the day. Meanwhile, I would be heading to my cozy bed for a few hours, eat plenty of food, stay plenty warm and spend time at a friend’s house before returning to my kindly husband in Charlotte. I’m glad things worked out for me to spend the night at the Overflow Shelter this week. I think about St. Francis of Assisi all day, I write about him and I read about him. He’s still an elusive figure to me as I try to read what he had to say by his words and his life. For me, wanting to spend the night at the Shelter is directly related to my wanting to understand Francis better. It is said that he followed Jesus more perfectly than anyone before or since. If he’d spent the night volunteering at the shelter, Francis would actually hang out on the bus, riding around all day, sharing stories and having great laughs with these guys, some of whom are very funny with their witty observations of the world around them. I, on the other hand, just hopped in my car and headed home after the night. Anyhow, I look forward to spending at least one more night there before it closes up for the season and I hope to find in Charlotte, some funny guys to sup with and I hope to make them laugh, even if it’s because I say something dumb. Every Ash Wednesday for the last eleven years, I’ve found myself reflecting back on that one time in 2004 when I did Lent right. I gave up chocolate, television, the internet, shopping, alcohol, talking on the phone, and wearing makeup. I didn’t get into a car even once, instead I walked everywhere I needed to go. I wrote letters to my family and dearest friends and was sure to tell them how much I loved them. I spent time every morning and evening in prayer, and I journaled every single day. I didn’t even cheat on Sundays. It was amazing. Okay, okay, I will come clean – I didn’t actually choose to do all that for Lent, it just sort of happened that way. At the time, I was starting my mission experience, and was taking language courses in a small, remote village in Northern Zambia. I had to travel light because I only had room for one backpack on the long and crowded bus journey to the village. Life was simple out there. My days were spent taking language classes, making new friends in the village, learning how to wash my clothes by hand, and tasting new foods (sadly, there was no chocolate to be found). But every day the sun would set promptly at 6 p.m., and I was left to myself in the quiet darkness, most often only lit by the dim glow of my kerosene lamp. It was just me and God then, and I found myself experiencing a closeness that I had never known before. Through the long silences, I learned how to open up to God and share about my fears and needs. I took comfort in God on those nights when I felt especially homesick. I finished up language school on Palm Sunday, and moved back to the big city just in time for Holy Week. That year, Easter seemed to take on a whole new level of meaning for me. I have tried to replicate that 2004 experience by giving up or taking on small things here and there. None of it seems to have the same effect. I haven’t yet regained that intense awareness of God’s presence that I felt during those simple days. Of course, it would be nearly impossible to give up all that I did in 2004, but today’s Gospel got me thinking that maybe it’s not what I do to observe Lent, it’s how I do it. Jesus reminds us that when we do good deeds, or give to charity, or fast, we should not boast about them. We should do them in the quiet. So, maybe it is the quiet part that I’ve left out of my recent Lenten observances. As I strive to live more simply, and love more deeply this Lent, I am also taking up the challenge to carve out room for silence to hear how God is speaking to me through this Lenten season. Spirituality: If you struggle with silence, Lectio Divina may be a great way to ease it into your life. This practice involves careful and repetitive reading of a particular passage in order to gain new insights. It is a quiet and introspective way to pray. Consider spending time with Psalm 139:1-18 to reflect on the constant presence of God. Want to learn more? The Carmelites provide a helpful guide to Lectio Divina here: http://www.ocarm.org/en/content/lectio/what-lectio-divina. Social Justice: During his first Mass of 2015, Pope Francis urged us to take action on behalf of those who bear the burden of slavery. “All of us are called (by God) to be free, all are called to be sons and daughters, and each, according to his or her own responsibilities, is called to combat modern forms of enslavement. From every people, culture and religion, let us join our forces,” he said. Statistics indicate that nearly 36 million people are experiencing enslavement today, most of them suffering in silence. Take some time this week to learn more about modern slavery, and determine which steps you would like to take to stop it. Visit http://www.usccb.org/issues-and-action/human-life-and-dignity/human-trafficking/index.cfm for more information. Simple Living: Have you decided to live more simply this Lenten season by giving up a favorite food or activity? Consider saving the money you would have spent on that item and making a donation to a local soup kitchen. If you are giving up an activity, carefully consider how you would like to use some of the free time to give back to your community. Community: You do not have to walk this Lenten journey alone. Sharing the experience with your community will help you stay committed to this important time of prayer and fasting. If you live in community, suggest a weekly meeting when you can all support one another throughout Lent. If you do not live in community, consider reaching out to some friends to form a supportive prayer group for this time. You may consider starting out by taking time to reflect on past seasons of Lent and recalling how you have grown through those experiences.